The story of how the Glyptotek’s Egyptian Collection came into being is now told in the book How It All Began: The Story of Carl Jacobsen’s Egyptian Collection. Mogens Jørgensen, How It All Began. The Story of Carl Jacobsen’s Egyptian Collection 1884-1925, edited by Anne Marie Nielsen, English Translation by Neil Martin Stanford. 174 pages, profusely illustrated. Paperback with flaps. “Bigger, but not as good as mine”. Thus Carl Jacobsen pronounced judgment when standing before a statue of the goddess Neith in Cairo Museum in 1909. Boasting, or just stating a fact – this observation from the head of Carlsberg Breweries’s travel diary epitomises in many ways the level of his collecting activity. Quality was of crucial importance and – combined with his wealth – a drive, which enabled him, in record time to create a collection of Egyptian art of outstanding quality at the Ny Carlsberg Glyptotek in Copenhagen; a collection which in 1909 was still growing, and which today is reckoned among the finest in the world. 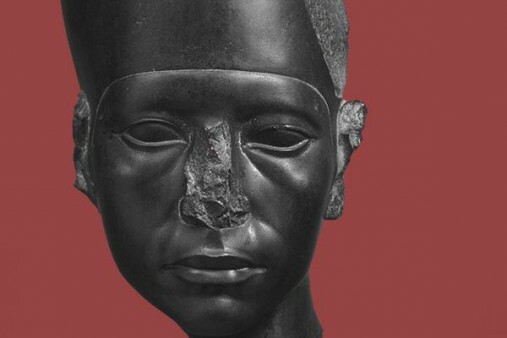 The story of how the Glyptotek’s Egyptian Collection came into being is now told in the book How It All Began: The Story of Carl Jacobsen’s Egyptian Collection, written by the museum’s egyptologist for 42 years, Mogens Jørgensen. Against the background of Carl Jacobsen’s innumerable exchanges of letters, together with an impressive body of archive material Mogens Jørgensen has clearly mapped out, how, in a race with other major collectors, and in dialogue with the Egyptian authorities, the Glyptotek managed to build up an Egyptian collection which, in breadth and substance, matched those of the great museums in other countries. The book also gives a rare insight into the art trade of those days with everything it involved of risks, luck and canny business practice. Last, but not least Mogens Jørgensen maps out the contours of the brewing magnate’s monumental Glyptotek-aspiration: to bring together art from across the cultures of the millennia under the same roof. But credit for the Glyptotek’s collection of Egyptian art does not belong to Carl Jacobsen alone. Early on he allied himself with Denmark’s first egyptologist, Valdemar Schmidt, who became the industrialist’s confidential emissary and buyer when it came to acquiring ancient Egyptian treasures. Focusing on the most important purchases and the correspondence between Schmidt and Jacobsen, How It All Began explains how, in the best sense, this dynamic duo complemented each other, such that both the brewer’s own, near-pharaonic predilection for magnificent, popular monuments and the egyptologist’s delight over the rare curiosities were united in one and the same collection. While Valdemar Schmidt was Carl Jacobsen’s leader in the field, the latter found inspiration for his vision of the museum with an art historian. How It All Began takes the reader into the mental world of Julius Lange, which came to form the foundations underpinning the brewer’s mission to draw the great line from Ancient Egypt, by way of Greco-Roman Antiquity to the art of his own era.